Tracking Items are categories you create that may apply to many families, children, employees or vendors. Possible uses of Tracking Items include : marketing (how someone heard about you), marital status, parent volunteers, bus runs, programs, activities, field trips, allergies, developmental milestones and whether certain forms or permission slips have been received. Most anything you’d want to track would work. Tracking Items are set up and managed the same way whether they are considered “global” or “local”. If you have just a single location the only difference would be the order in which they appear. Global items appear before local ones when you assign them to a family, child, etc. If you have multiple locations and want the tracking to be available to different schools, you will need to set your Exposure Settings to the specific locations. Tracking Items are best used for categories of things that apply to many families or children, such as bus runs, activities or programs. If you are wanting to track something more specific, such as exact income or a specific date of some event, a better solution is to Create a User Defined Field. Go to Data Management > Tracking Items & User Defined Fields. Dbl-click either Global Tracking Items or Local Tracking Items. A Group is the overall category for the thing you want to track. If you were tracking income levels then “Family Income” would be the Group and the various income levels would be Items within the Group. Click a tab at the top depending on whether these tracking items will apply to the Account (family as a whole), Child, Employee or Vendor. To create a new Tracking Group click the top (blank) line and enter a Tracking Group Name like “Family Income”. Then choose whether the Group Type will be Single Item (you can only select one item in the group) or Multi Item (you can select as many as you want for the same family, child, etc.). Then add Tool Tip Text (optional) if more info is needed to explain when to use this group. Then tap Enter. 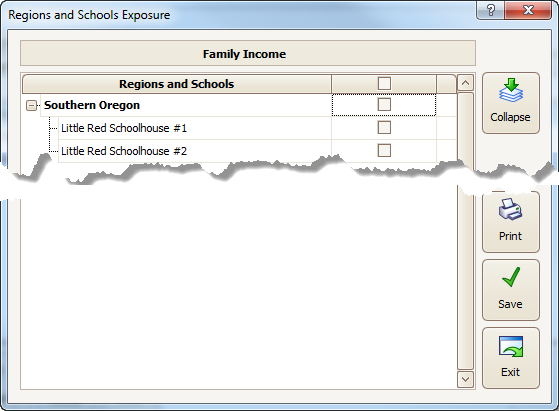 You will now be on be on the Regions and Schools Exposure screen. Check all locations that need access to this group. You will not be able to assign any items in this group (to an account, child, etc.) until you Expose it. See: Exposure Settings. Select Save, Exit. Use the Up & Down arrows to change the Tracking Group order if needed. Once you’ve got a Group you’ll want to add Items within the Group. These Items will be the things you may assign to specific families, like a range of income levels. Begin at the Global Tracking Items screen (continued from above) with your various Tracking Group Names showing. Click the plus sign (+) next to the Group to which you want to add Items. This will expand the Group showing you any Items that have previously been entered. To add a new Item click the top (blank) line and enter an Item Name. For income levels your first item might be called “Zero to 12,000”. Set a Usage Limit (optional) to be alerted when this item has been assigned to more than a certain number of people. Click once in the Usage Limit box. Remove the check from “Unlimited Use”. Enter the number of times this item may be assigned before being warned. Note 1: For multiple locations the limit is combined. If the limit were 24 and the item were exposed to 3 locations, then a combined total of 24 people could be assigned from those locations (i.e. 8 from each or any combination that equals 24). Note 2: The Usage Limit alerts you when a Tracking Item is assigned to more than the specified number of people. You may also choose to be alerted in advance (as you approach the limit. See “Nearing Usage Limit” under Regional & School Options. Enter Tool Tip Text (optional) if this item needs further explanation for staff members who will assign it to people. MyProcare also uses this field as the actual question when the Tracking Group Name is selected for the parent questionnaire. Tap Enter (on your keyboard) to create a new blank line. Continue adding new items to this group tapping Enter after each one. Use the Up & Down arrows to change their order. Click Save. Repeat steps to add new Groups and Items. Then click Exit. Next: Assign Tracking Items to a Account, Child, Employee or Vendor. How do I set up Vendor Tracking for 1099s? May I print statements by classroom? How do I set up Bus Runs? Can I print statements ONLY for certain families, like those that don’t have email?